At least 30 people were wounded in Tuesday’s attack near the SYL hotel, which is located next to the heavily fortified Somali presidential palace in Mogadishu. The blast sent plumes of thick white smoke into the sky. 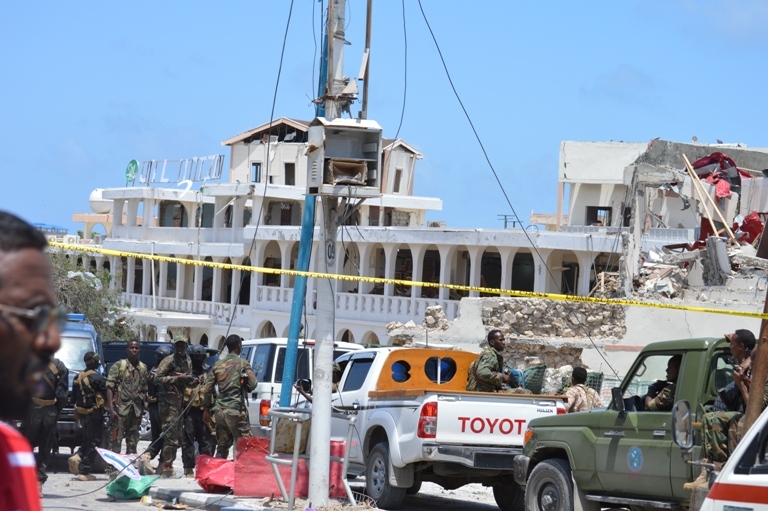 Somali security ministry said in a statement that key government ministers were holding a meeting on national security in the SYL hotel at the time of the suicide explosion, for which responsibility has been claimed by Al Shabaab. Ahmed Hussein, a nurse at Medina hospital, which is the biggest health facility in the capital, said they have received 30 wounded people, some with critical injures and some who were pronounced dead upon arrival. The minister of ports, Nur Farah Hirse, was among those wounded in the Al Shabaab bombing, the nurse said; additionally, several presidential guards were killed in the blast. 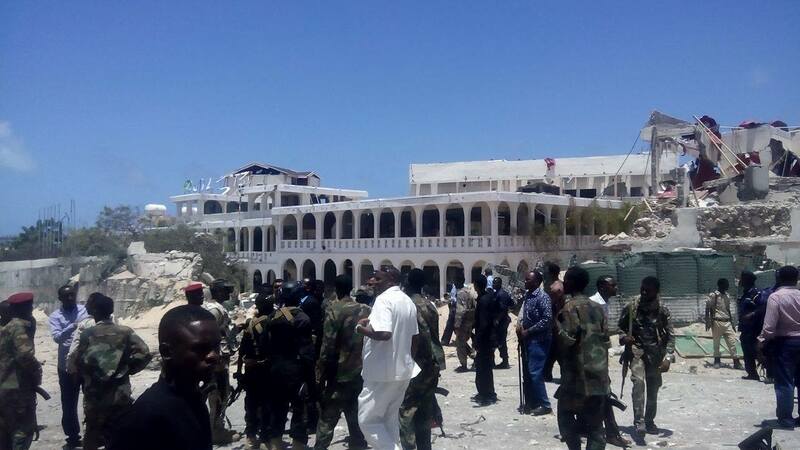 “The blast was so powerful and caused huge destruction in the SYL hotel and nearby buildings, including the entrance of Somali palace (Villa Somalia),” Capt. Hajji Osman, a senior Somali police officer tells ArmedPolitics. An Al Shabaab bomber rammed his explosives-laden truck into the main entrance of SYL – Somali Youth League hotel, near the hilltop Somali president palace in Mogadishu, police said. 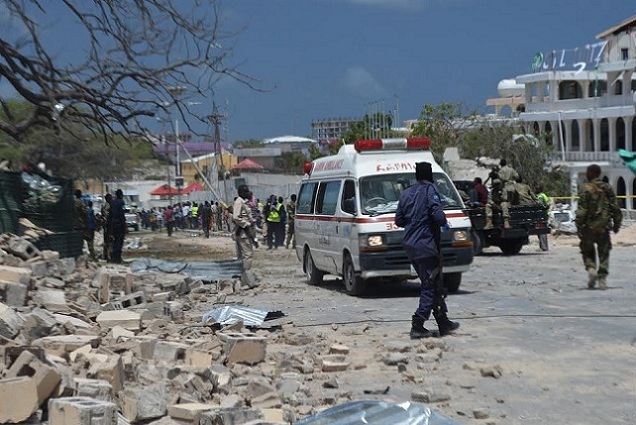 The explosion happened at around 12:00 A.M. local time and it was heard in parts of Mogadishu, the seaside capital of the conflict-riddled Horn of Africa country. 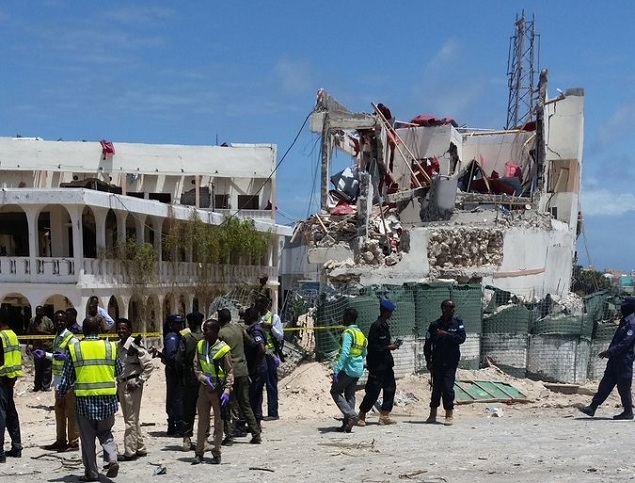 The Mogadishu police chief said he fears the death toll could rise. 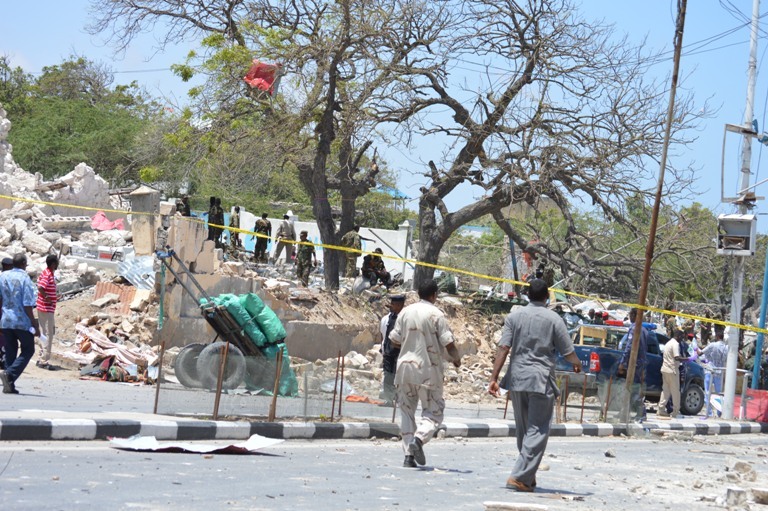 Somali leaders have condemned the latest attack, and have praised the security forces ‘swift’ response, which they said prevented the bomber from reaching his intended location. On Thursday night, Al Shabaab gunmen attacked Banadir beach restaurant near the Turkish Embassy in Mogadishu after blasting their way through with a car bomb explosion, killing at least ten. Somali troops, backed by UN-mandated 22,000 African Union soldiers, pushed Al Shabaab out of Mogadishu in 2011 following joint offensives, but despite their losses, the Islamists are still capable of carrying out suicide and gun attacks in the capital.